A new study by the University of Michigan Transportation Research Institute indicates that older drivers are hanging onto their licenses for a longer period of time - while the number of young people with drivers' licenses is falling. Both trends have safety implications. Eighty percent of 18-year-olds had a driver's license in 1983. That number had fallen to 65 percent by 2008. Younger drivers tend to have more accidents. So fewer of them who drive could make the nation's roads safer. Michael Sivak is a research professor at the Institute. He says there's two main reasons for the trend. Many people in their teens and early 20's are moving to big cities, where there is often good public transportation. And then there's Facebook and Twitter. "Young people these days are more interested in virtual contact than actual contact," says Sivak. "This is a little tongue in cheek - but there is an increased emphasis on being connected through other means than in person, and therefore driving is not as necessary as it used to be. But at the same time, older drivers are keeping their licenses to drive longer. And older drivers have more accidents, too. 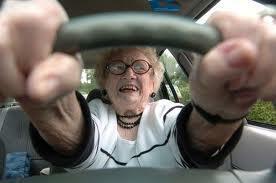 In 1983, 55 percent of people over the age of 70 had a driver's license. That number shot up to 78 percent by the year 2008. Older drivers often have poorer night vision than people in middle age or younger, and they may not be able to turn in their seat easily to see if a car is passing them. Sivak says car companies are well aware of the problem, and they are developing cars with technology that will help older people drive more safely. That could help improve road safety in more ways than one. "What we do to improve the driving performance of the elderly will help middle-aged drivers as well," says Sivak. Some vehicles already have technology that sounds a warning if a car is in a driver's blind spot, and radar that automatically slows a car down if it's in imminent danger of crashing into another vehicle. Automakers are also working on technology that allows vehicles to communicate with each other and the road. The ultimate aim is to build vehicles that are extremely difficult to crash.